Any rigid heddle loom, table loom or floor loom requires warping, the purpose of which is to measure your warp threads and align them so that they do not get tangled and can be easily threaded on the loom. Newer weavers may still be intimidated with this process, but fear not! 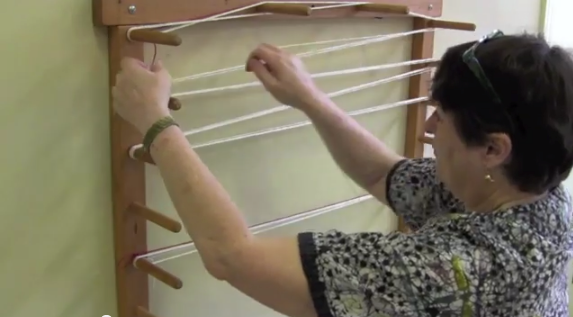 We are here to help you master the ins and outs of warping your loom - it's as easy as 1-2-3! First, let's get to know your warping board a little bit better. It's important to know the distance across the board and between pegs, as our resident weaving instructor Nancy Reid demonstrates in the video below; having this information will help you plan the best path for your warp. You'll begin with a leader thread which is a different color from your warp - any smooth, sturdy yarn will do! The leader allows you to easily lay out your warp, and should you find you're missing a warp end, leaving your leader on the board will ensure you can create more warp ends of the same length. At last, it's time to remove the warp! An important detail to keep in mind is that the cross will need to be secured before the warp is removed. In the video below, Nancy demonstrates an easy way to get your cross secured before removing the warp, along with her tried-and-true method for safely removing the warp by making a chain of loops similar to a crochet chain. This chain will keep your warp nice and tidy til it comes time to use it.